There are a several problems with trying to get such a high percentage of your player base to control their physiology in the manner you want. First off, physiological signals are notoriously messy to deal with, especially in the field. They are susceptible to lots of interference from outside (ambient temperature) and within the body (muscle artifacts) and so there’s no guarantee you’ll be able to access any given measure with ideal fidelity. For example not all people generate detectable alpha waves (if memory serves, a minority of 5-10% of the population) which the majority of EEG toys use. Heart rate is pretty stable, but detection is reliant on the task and sensor placement (e.g. see my evaluation of a finger based oximeter when playing Red Steel). Our next problem is how well can people self-regulate their autonomic and neurological systems? Breath control, which will be the main tool players will use in regulating their HR in a relaxation game is pretty easy to do. However there is also an important dynamic between autonomic self-regulation and the mechanic of the game being played (e.g. filtering surface EEG introduces several seconds of lag, so 1-1 control between thought and action can be somewhat awkward). Perhaps the game mechanic Nintendo implemented was designed with an expectation of a certain speed of response, which turned out to be faster response than 20% of their test participants could generate (though this is the least likely of causes, as it would be become quickly apparent about how breath control influences heart rate). Perhaps Nintendo makes use of an inappropriate algorithm for judging the control effect. For instance in the GSR relaxation game by MIT Media Lab Europe, only the direction of a change in GSR was used to control the game as its impossible to compare people on an absolute scale when measuring skin conductivity (too many variants), thereby making the game open to as many players as possible. But even with an appropriate algorithm you’re not going to be able to support everyone as we come to our last problem – that physiological responses to similar stresses can vary considerably from person to person**. Psychophysiological studies tend to focus on person independent physiological changes. That is to say, a subject pool undergoes a number of identical tests and the average effect is assessed for significance (e.g. heartbeat rate increases to cognitive stress). The majority of physiological games (and I imagine Nintendo’s will be as well less they’ve done something special) are what I would categorise as dumb physiological games as they rely on generalised behaviours to inform a physiological interaction and as such will never be capable of supporting the totality of a player base because they don’t address individual physiological responses. 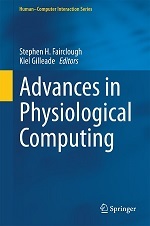 Stephen has already touch upon this problem in Fundamentals of Physiological Computing, and Designing for the gullible, given the imperfection of the relationship between physiological signals and psychological measures, physiological interactions should be designed with failure in mind. So, in Steve’s example from this CHI presentation, imagine a super power that only works sometimes depending on self-regulation and signal quality. So to recap, there is a whole host of reasons why trying to support 99% of players is the wrong approach to take towards your physiological game. Indeed some issues can be addressed by better technical solutions (e.g. designing a mechanic around a control effect), but at the end of the day their are certain physical limitations which will hamper any physiological interaction and developers need to accept that. In the case of individual physiological responses a learning machine could be applied to identify these responses, however such systems / research are in their infancy. * This is known as individual response specificity in psychophysiology literature. Designers also need to pay attention to the Law of Initial Values, which can also play a role.